CORSICANA – The Grapeland Sandies and Sandiettes are making this a habit. 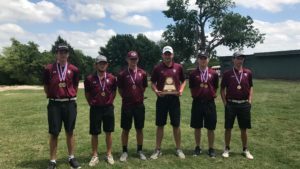 Since the start of the 2009-2010 school year – every time a state golf tournament has been held – Grapeland High School has qualified either an individual player or a team to compete for a state championship. 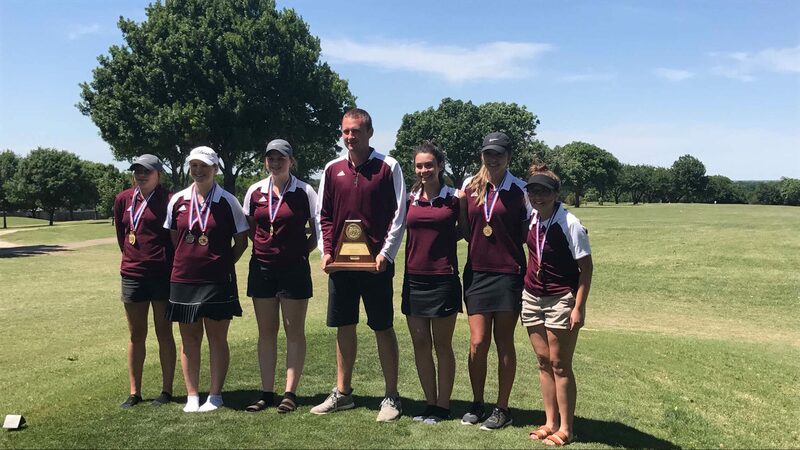 This time around is no different and for the third consecutive year, both the Grapeland Sandies and Sandiettes will be travelling to Austin to compete for a gold medal in golf. This week, the GHS boys’ golf team teed off on Monday, April 24 in the Region III Golf Tournament held at the Corsicana Country Club. After the first day of play, the Sandies were in first place after shooting a combined total of 294. The Douglass Indians were in second – 50 strokes behind – with a combined 344 while the Bosqueville Bulldogs were in third place with a combined score of 351. Day two action on the links saw Grapeland push its advantage to a whopping 88 shot advantage as the Sandies captured the team title with a two day total of 598. Douglass finished second with a two day total of 686 and Bosqueville finished third with a total of 715. The Sandies were paced by Rick Frauenberger who shot an opening roun d 67 and carded a 70 on day two to win first place at the individual level with a score of 137. Grapeland’s Brayden Cheatham shot a 71 on the first day of competition and a 76 in the final round for two day total of 147. Cheatham’s 147 placed him third in the individual competition, just two shots behind Douglass’ Trevor Roquemore who finished second with a two day total of 145. Rounding out the Grapeland team were: Case Boyd who shot a combined 155; Riley Chipman who shot a 159; and Josh “Bear” Ackley who recorded a score of 217. Following the conclusion of the boys’ tournament, the girls took over the greens and fairways on Wednesday, April 26. Taking a cue from their teammates on the boys’ side, the Sandiettes also staked their claim to the top of the leader board after the first round of play. Grapeland shot a combined 408 in blustery conditions to lead the Crawford Lady Pirates by 25 (433) at the end of the first day. The Moody Lady Bearcats were in third place with a combined 451. On day two, the Sandiettes left no doubt as to who was taking home the first place trophy as they shaved 34 shots off their Wednesday total to record a 374 and a combined 782. Crawford finished in second with a combined 851 while Moody was third with a total of 921. Leading the way for the Sandiettes was Hannah Chipman who shot an 85 in the first round and an 84 in the second round to win the individual gold medal with a total of 169. Right behind Chipman was teammate Jenna Lawrence who shot a 92 in the first round and then dropped 10 strokes from her score with an 82 on Thursday to finish in second with a total of 174. In third place was Crawford’s Hannah Williams with a 90 on day one and an 88 on day two for a combined 178. Rounding out the state-bound Sandiettes golf team were: Madelyn Conner who shot a combined 204; Carly Parker with a 235; Callie Richburg with a 238; and Sayler Leblanc who carded a 251. The girls’ state tournament will be held on May 15 and May 16 at the Roy Kizer Golf Course in Austin. The boys’ state tournament will be held the next week on May 22 and May 23, also at the Roy Kizer Golf Course. Congratulations to both the Sandies and Sandiettes and Good Luck at the state tournament!! Next articleHORACE MCQUEEN: Words of Wisdom – or something else!